The DAFIA Project is funded by the EU Research and Innovation Programme Horizon 2020. It aims at reducing the heavy dependency on fossil resources by converting municipal solid waste (MSW) and marine rest raw material (MRRM) into high added value products. Nowadays in Europe approximately 150 million tonnes of municipal solid waste (MSW) are landfilled every year. Furthermore, more than 1.3 million tonnes of marine rest raw material (MRRM) are generated in Europe each year, produced mostly by fishing countries like Norway and Denmark. Finding a sustainable production and exploitation of renewable biological resources is an ongoing technical challenge. In facts, one of the European Commission’s key priorities is the implementation of environmental and waste policies, according to the 7th Environment Action Programme and the Roadmap to a resource efficient Europe. In accordance with these priorities, the EU Research and Innovation Programme Horizon 2020 funded the DAFIA project. This project has designed a cascade approach in order to maximize the value of each component of the MRRM and MSW, while limiting negative impacts on the environment and reducing the heavy dependency on fossil resources. 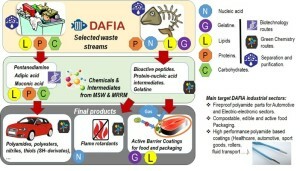 With this aim, DAFIA partners explore the conversion routes of MSW and MRR M from the fish processing industries in order to obtain high added value products, such as flame retardants, edible/barrier coatings and chemical building blocks (dicarboxylic acids and diamine) to produce polyamides for a wide range industrial applications (Figure 1). Until now, the production of more complex chemicals has been limited by large-scale economic feasibility due to pre-treatment and conditioning costs of the recalcitrant raw materials. To overcome this challenge, DAFIA approach consists in developing more cost-efficient pre-treatment and fractionation methods that will open for the use of MSW as a general fermentation substrate, utilising either the carbohydrates only or the complete organic fraction. The research activities started with the selection, characterization and pre-treatment of the raw materials, observing variability with stock associated substrates for MSW – which is not dependent on regional or seasonal parameters – and enzyme doses standardized on total glucan content to minimize variability effect. Sorted organic fraction MSW and/or mixed waste are good candidates while unsorted MSW has high amounts of inerts and lower sugar content. Differently, no variability has been observed for the salmon waste. For both streams, freezing is a suitable preserving technique for long term storage. Then, the initial fractionation of lipids, proteins and other water-soluble compounds has been carried out successfully achieving yields above 90%. In the meantime, the most cost-efficient technology for isolation and purification of nucleic acids and gelatine has been developed. In parallel, these extracted components have been used both for the production of novel green flame retardants (FR) (patent filled) as a viable alternative to ammonium polyphosphate and the compatibilization of nucleic acid-based FRs to bio-polyamides, which requires high processing temperatures. The new compounds are being validated mainly for the automotive sector, using the most accepted fireproof standards utilized by the main car manufacturers. Gelatine obtained from marine residues is an excellent alternative to animal sources. Due to its unique properties, gelatine might be used for the preparation of both edible and barrier coatings for fish and packaging for fish products and other foods that require barrier properties, prolonging their shelf life. The major challenge addressed in DAFIA project is developing a robust microbial strain able to produce the targeted chemical building blocks (diacids and diamines) with high productivities by fermentation of pre-treated MSW and MRRM components. Fermentation process is being optimized at laboratory scale using low pH values, which decrease the risk of contamination by bacteria and allow the production of organic acids in their undissociated form, reducing the purification costs. Once optimized, the most promising process will be tested at pilot scale to evaluate the feasibility of the transformation into marketable products. Furthermore, the diamines and diacids obtained from the fermentation of MSW are being used as monomers in the synthesis of different polyamides with a bio-content close to 100%. Finally, a life cycle and techno-economic viability assessment will be conducted to evaluate the impact of the full process proposed in DAFIA project to ensure compliance with legislation, to maximise market acceptance and facilitate increasing optimisation of these processes and products. Innovation management, preliminary business plan, dissemination and exploitation activities regarding the project results are being done together with the initial contact with possible stakeholders outside of DAFIA consortium interested in the project results. 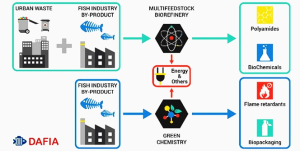 At the end of this Europ ean project, the participants hope to show the viability to provide added value to the waste (Figure 2), converting products currently without utility into high-value substances such as flame retardants, coatings and polyamides, mitigating climate change and moving Europe towards a more sustainable society. Text by Laura Martí, Belén Monje, Frederik De Bruyn, Nalan Onar.